Note: Public Access begins at 8:30. A small parking lot is available on East Pine and South Race Streets. Metered parking is available around the Courthouse. Non-metered on-street parking is available further down East Pine Street (towards Union Cemetery). Jurors who arrive early, can possibly find a parking space in the Courthouse's parking lot located at East Pine Street and South Race Street. If no parking is available in the Courthouse parking lot, juror's may park on South Race Street, the street that runs behind the Courthouse. However, the parking spaces closest to the courthouse have parking meters. Jurors can find non-metered on-street parking further down the street (proceed through the intersection heading south toward Union Cemetery). Jurors Please Note: Do not park in "Permit Only," "2-Hour Parking" or "1-Hour Parking" spaces. 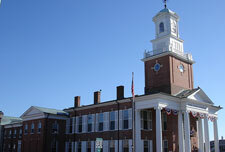 It is the policy of Sussex Superior Court that the public is prohibited from bringing in any food or beverage item into the court house. All food and beverages items MUST be consumed outside the court house and prior to entry. Considerations will be made for medical reasons and for children. During the security screening process, a determination will be made on a case by case basis as to the legitimacy of allowing a food or beverage item into the court house. For those considerations made, the items MUST be in unopened, non-glassed container. At NO time will food or beverage items be allowed into the court rooms. Glass containers brought in by staff should be disposed of in secured staff accessible areas only.